This room was begging for something BIG to happen in it’s life, I think. We liked it so we had to put some rings on it. Ceilings are way too often forgotten. They are left stark and barren and nondescript. They’re a wasted opportunity. 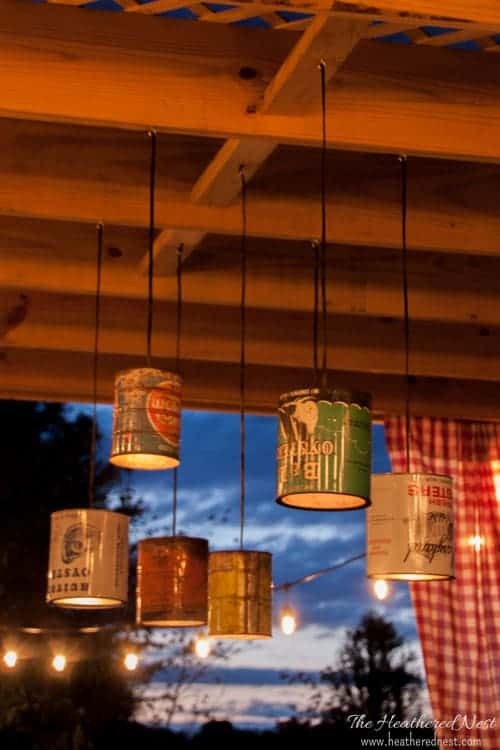 Especially when you consider that you can make a BIG impact on a ceiling, for just a little money invested. 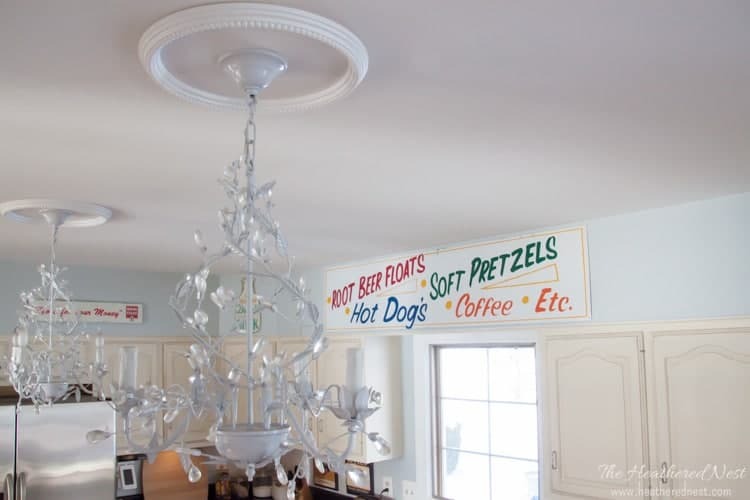 True, not all ceiling treatments are inexpensive. Building a coffered ceiling, for instance, can certainly be a budget buster. But paint, by itself can go a long way. And so can ceiling molding. 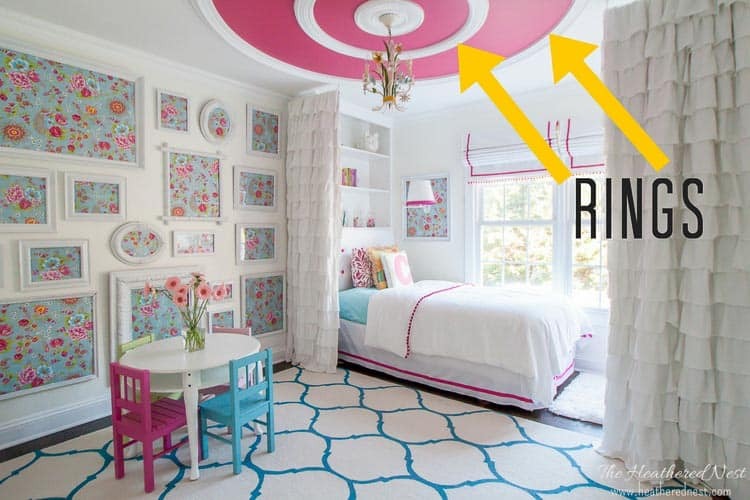 In the case of our daughter’s pink bedroom, we used ceiling rings and a ceiling medallion. 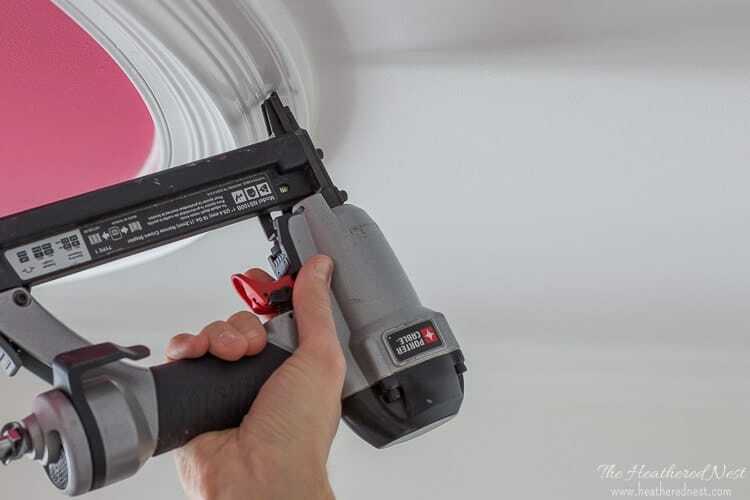 Today, we’re going to show you how to install ceiling rings. 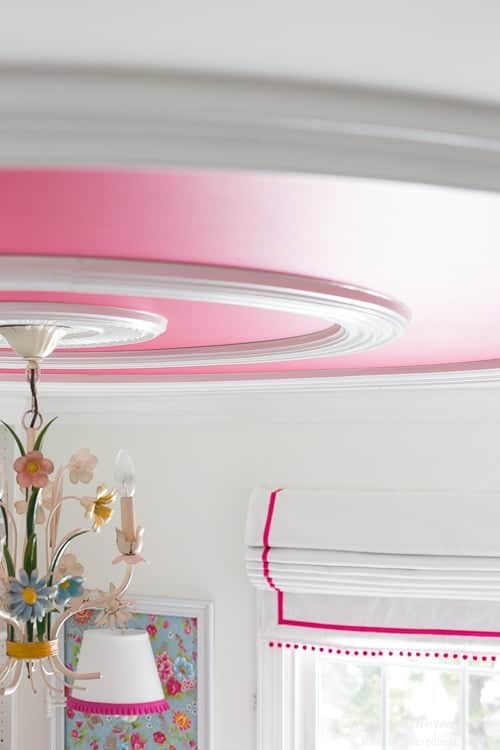 Round ceiling molding, or ceiling rings are made of FOAM. 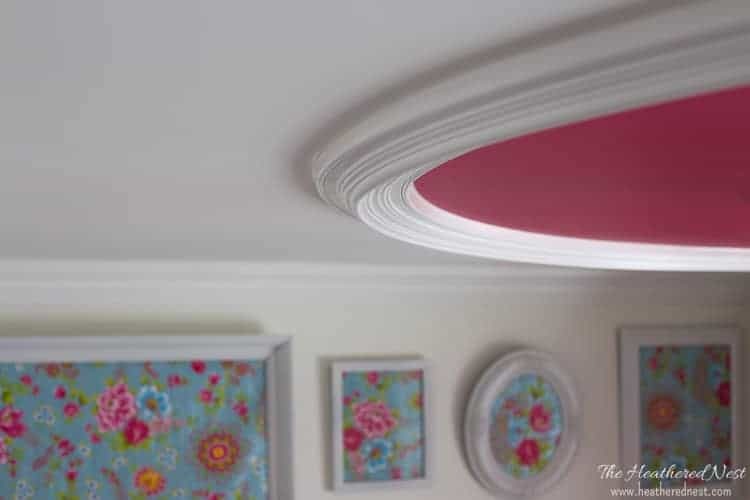 how to install round ceiling molding, AKA ceiling rings. 1. 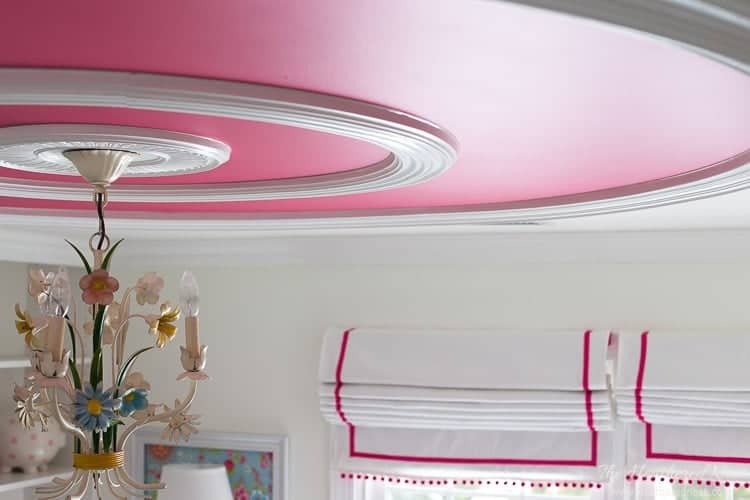 Decide on the size of your ceiling molding treatment. Since we started with a boring shell of a space, we wanted this feature to make a BIG impact. So we went for broke. 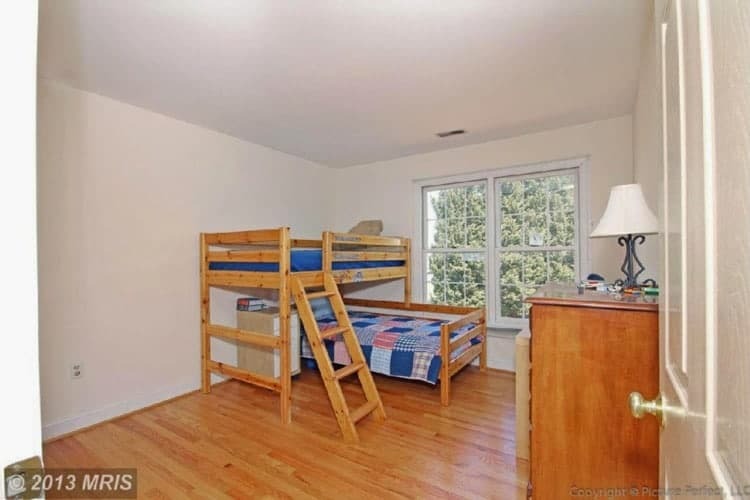 The dimensions of our daughter’s room are roughly 10′ x 12′. The diameter of the large ceiling ring we chose is 7′. The inner ring’s diameter is approximately 3.5′. And the rings themselves have a width of approximately 4.5″. All this means…DON’T WIMP OUT and go too small if you’re looking for a big impact. I know it will seem scary, but power through the fear. If on the other hand, you’re looking for a subtle effect, then do the opposite of what we did. 2. Purchase your ceiling ring(s). These rings can be purchased at a variety of places like Home Depot, even Amazon. Depending on the diameter of your ring(s), they will be sold in a quarter circle, or half circle piece of molding. Our large 7′-ish (outside diameter) ring is similar to THIS ONE from Home Depot, or THIS ONE found on Amazon. The smaller 42″-ish (outside diameter) ring is similar to THIS ONE from Home Depot, or THIS ONE found on Amazon. 3. Find the center of the room, or the desired center of your ceiling ring. This ceiling feature was going to be in the center of the room. 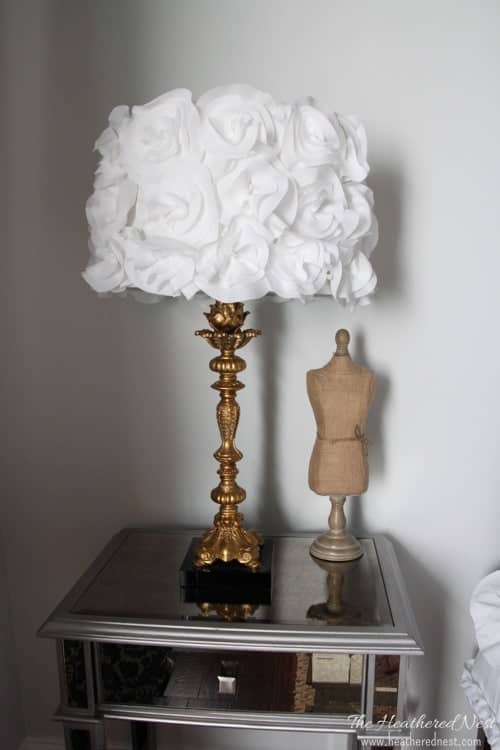 You could put yours anywhere in your space you’d like, however. For us, it was easy to locate the centerpoint for our feature because there was a cover plate for a ceiling light there. 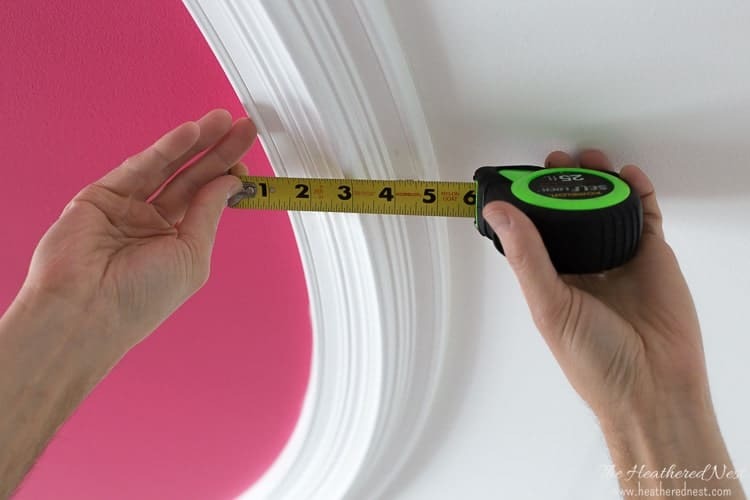 If your center point isn’t so easily demarcated, then you’ll have to whip out the measuring tape, maybe a laser level, and locate the center point for your ceiling feature. 4. 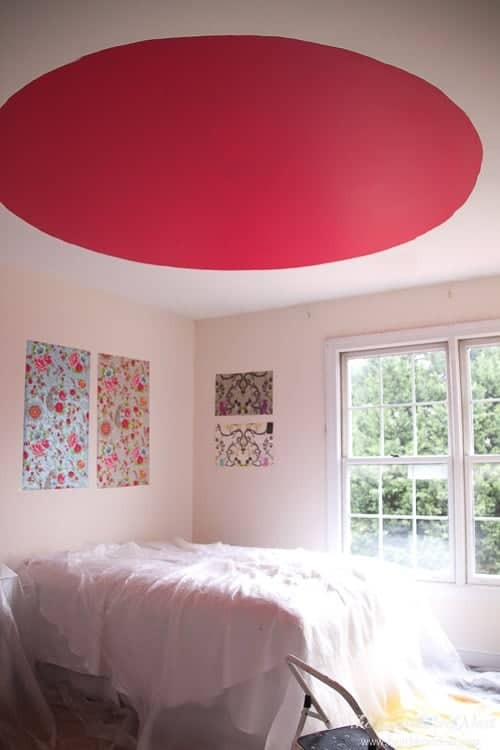 Pencil a circle onto the ceiling. Figure out the radius of your large ceiling ring (1/2 the diameter). Grab a ball of string, and tie one end around a pencil. 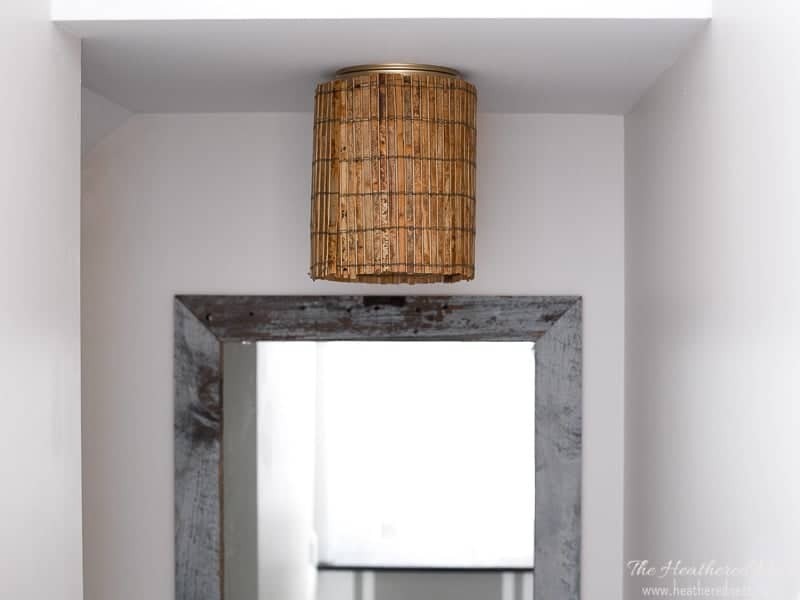 Now cut the string so that it is at least an inch shorter than the (outside) radius of your ceiling ring (so the pencil line won’t show…if your ceiling ring is 4″ wide, then subtract 2″ from that length and cut your string). This way your pencil line should be in the dead center of where your ceiling ring will land, and any bleed over from your paint job will not end up outside your ceiling ring. Tape a sharpened pencil to the end of a yardstick, or hockey stick, or something similar…it needs to be long enough so that you will be able to mark the ceiling while standing on the ground with the pencil “tool” in hand. Tape the pencil on REALLY WELL. If you have a partner, have them stand on a ladder, holding the other end of the string on the ceiling at your center point. If you are attempting this part solo, then tie the string end to a nail, and hammer the nail into the center point on the ceiling (just be sure that the length of your string correct after tying it onto the nail before you start marking the circle). Don’t fret if your circle isn’t perfect. It should work out just fine as long as you’re in the ballpark of having something up there that resembles a circle. If you are going to be painting the inside of your ring(s) a color, then now is the time to break out the paintbrush and roller. Prep the space first with tarps or painters plastic. Remember, you’ll have some wiggle room around the diameter of the circle, so you shouldn’t have to paint perfectly inside your pencil marks. If you look closely at our painted circle above, you’ll see it’s NOT perfect at all. We used Ben Moore “Razzle Dazzle” for this, in eggshell sheen. 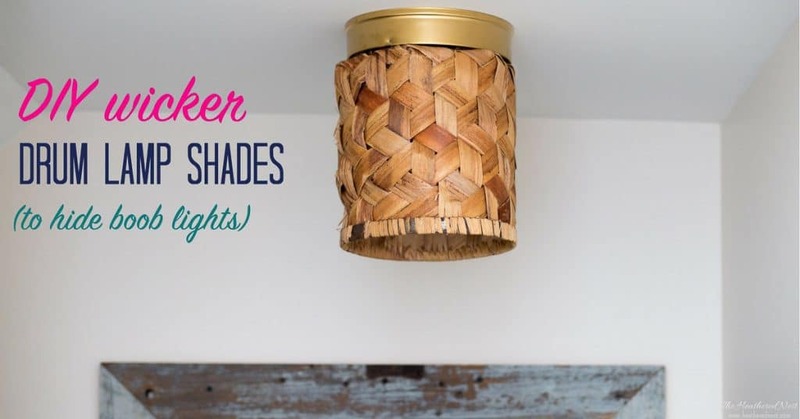 If you’re not sure what sheen to choose, READ THIS. We first attempted installing the rings with a nailgun. It didn’t work AT ALL. This is foam, and the nails from a nailgun don’t have heads, so there was nothing to grip the foam. Instead, we used a pneumatic stapler with 2″ staples. Worked great. 7. Fill staple holes, then sand. After your rings are installed, it’s time to fill all the holes left from your stapling. Use whichever product you’re most comfortable with, if you have a favorite. I’m a joint compound girl, myself. I just stick my finger in a tub of joint compound and fill holes with my finger. Works great, and that way, I don’t end up with gobs of putty or compound on the holes that will have to be sanded off and make a giant mess. Once your putty or compound dries, take a high grit sanding block (something like 400-ish) and sand til smooth. Caulk is going to make this whole ceiling treatment come together. Fill the seams where the sections of your ring(s) come together, and then place a nice smooth, continuous bead of caulk along the inner edge and outer edge of the rings. 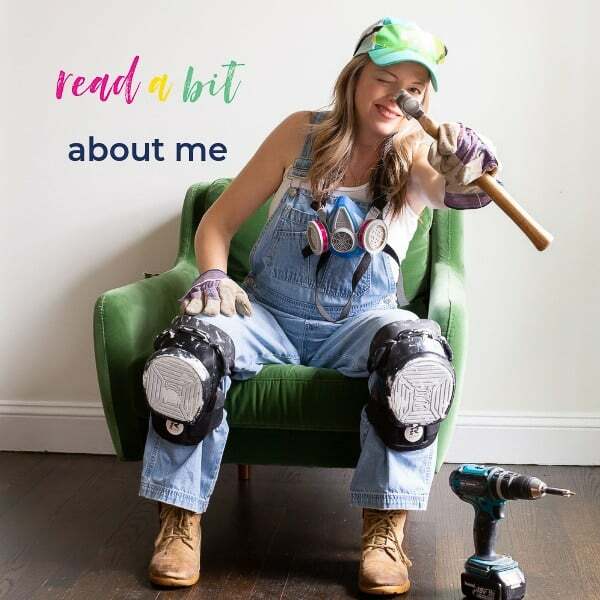 If you’re not totally comfortable with caulking, read a DIY tutorial first. There are bunches out there. 9. Paint the ceiling ring(s). Last step! 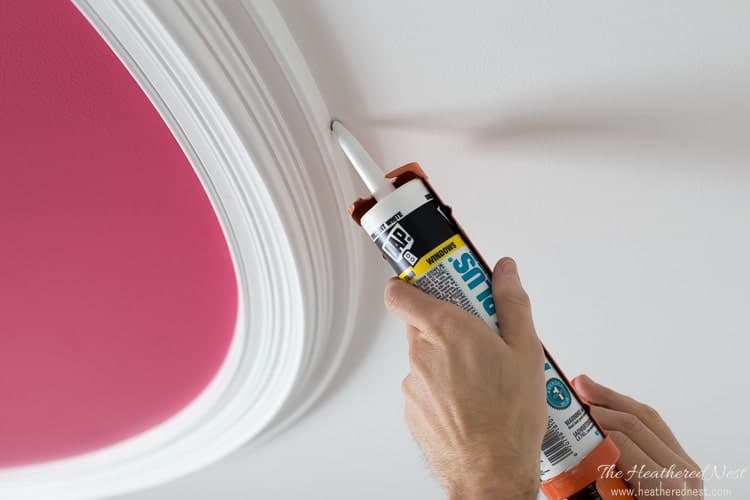 Once your caulk is dry, you can paint the ceiling ring(s). 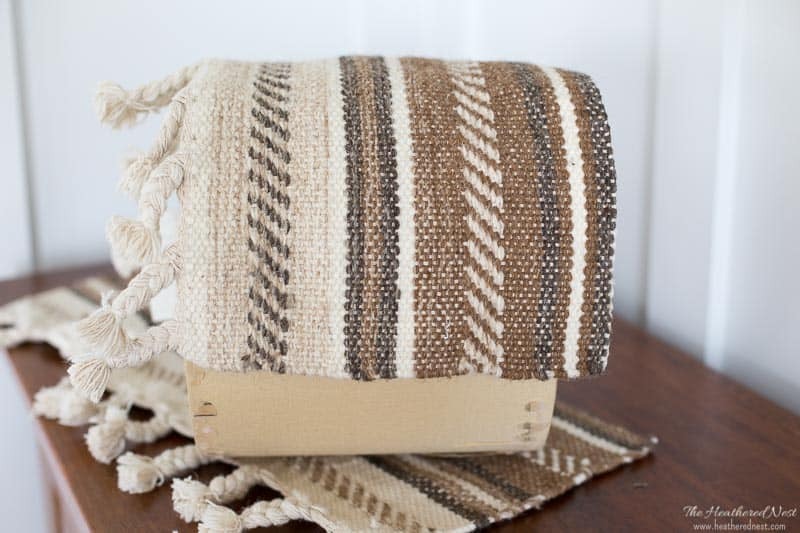 This could be done in many different colors, even different sheens. We chose a pure white semi-gloss paint. If you’re not sure what sheen to pick, we can help you figure that out. And now, you’re done! Do you like it now that you put some rings on it? Don’t make me start dancing…nobody needs to see that 😉 Hope you like how your ceiling molding out though. Now, if you still need to install your light, make sure you get a professional to help with wiring if you’re unsure about the how-to on that. Much higher risks involved there than screwing up a painting project like this one! 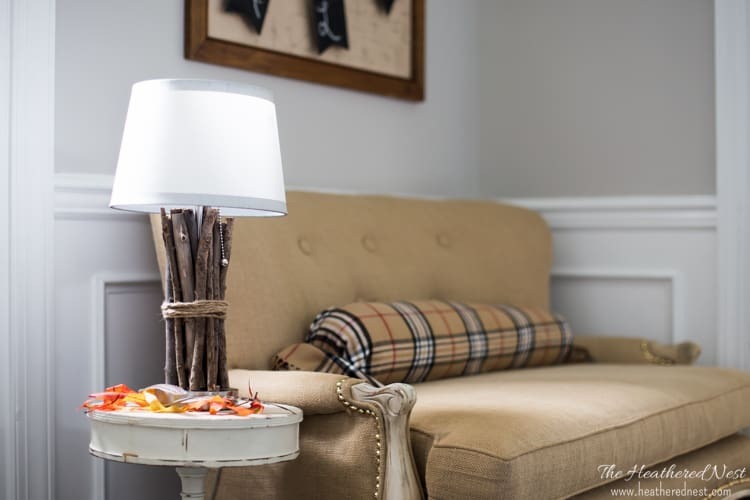 If you’re putting a pendant or chandelier in place of an existing recessed light, then we have written a post about that process…same caveat about being comfortable with wiring applies. 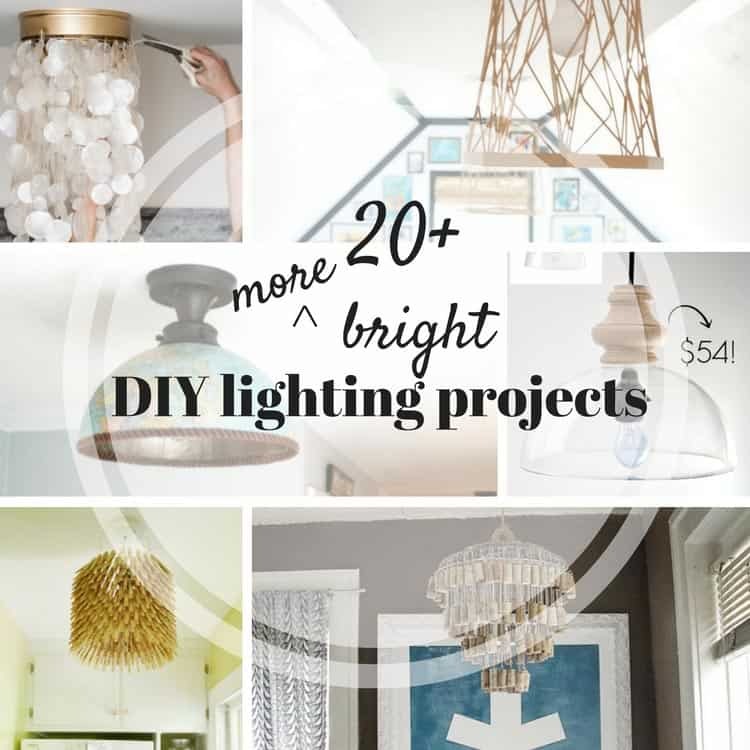 If you are even slightly unsure about DIY’ing with electricity, the answer is NO. Don’t try it. « Stuck in the mud. Any thoughts on painting the rings first, and then just touching up the caulked/puttied areas? I usually do anything I can to avoid close, stressful painting, like cutting in. Great point, and that is TOTALLY what we did. Will edit the post b/c I forgot that!! 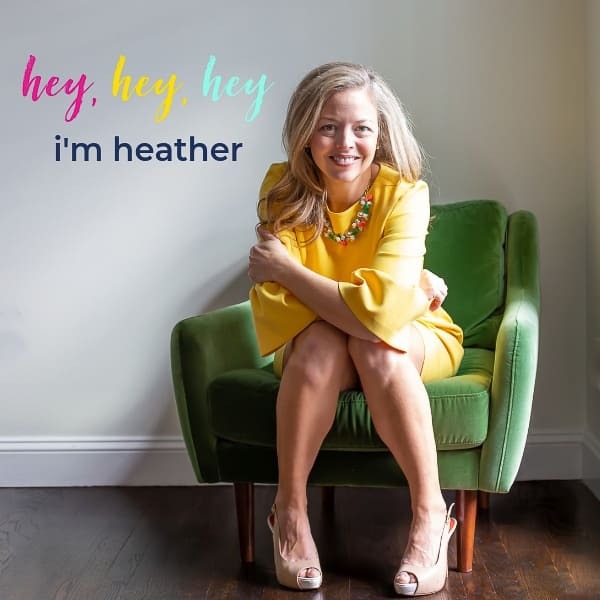 Oh Heather, your daughter’s room is just dreamy! 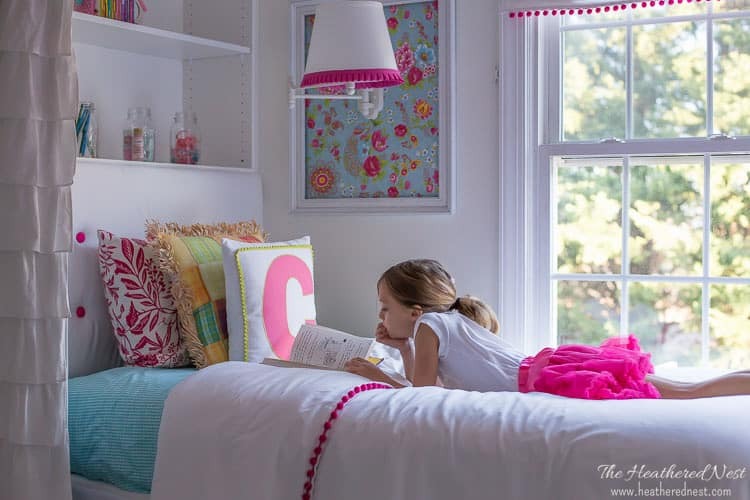 I love the bright colors and little details like the pompom trim on the curtains. And, the ceiling…WOW! It’s gorgeous! Thank you so much for sharing this. Us girls do love our rings!